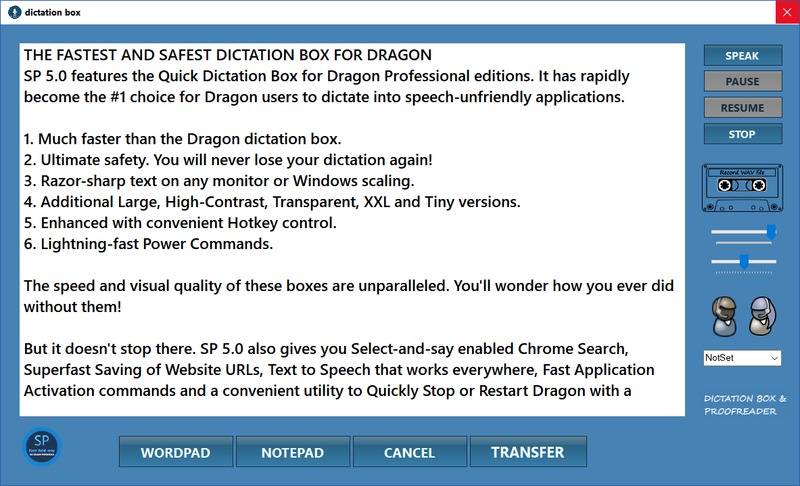 SP 5.1 Standard features the Fastest Dictation Boxes for Dragon professional editions. 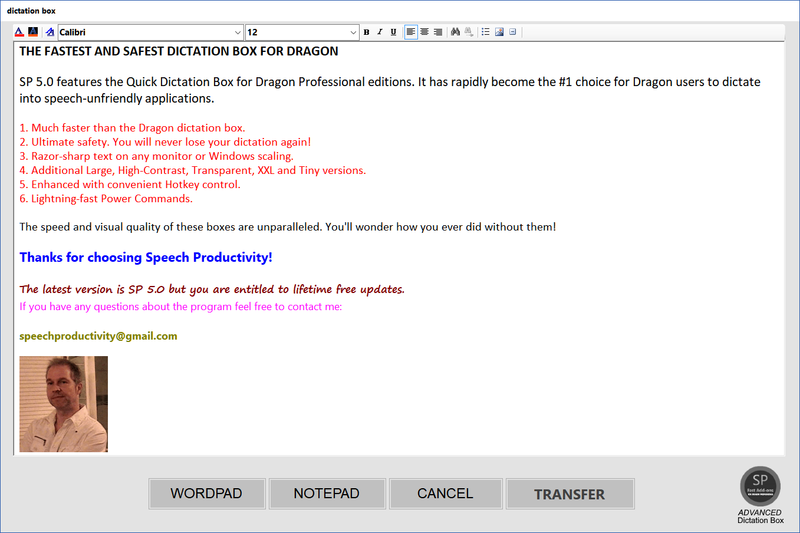 Speech Productivity has rapidly become the #1 choice for Dragon users to dictate into speech-unfriendly applications. ⦁ Dictation Boxes load almost instantly. ⦁ Ultimate safety. You will never lose your dictation again! ⦁ Razor-sharp text on any monitor or Windows scaling. ⦁ Large, High-Contrast, Advanced, Transparent versions included. ⦁ Hotkey control for launching the box and transferring the text. ⦁ Advanced formatting. Bold, italicize, colorize text, insert bullets etc. ⦁ Ultimate placement control. Place the box anywhere on the screen. ⦁ Optional continuous dictation backup. ⦁ Proofreading out-of-the-box that just works better! Want the ultimate SP experience? Then choose SP 5.7 Professional. Read more about it here. 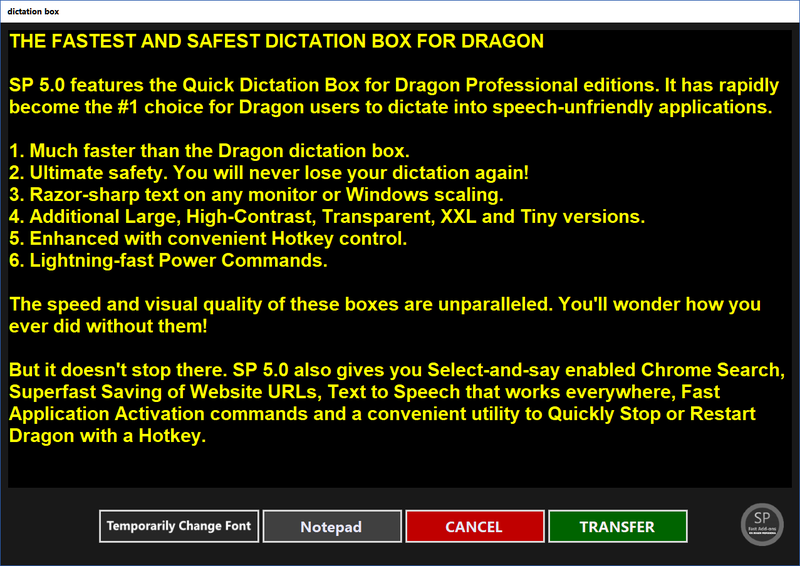 The SP Dictation Boxes load In 0.4 seconds. That's much faster than the Dragon dictation box. It's even faster than Notepad. If you use additional Hotley control it launches instantly! (SP 5.7 Pro has additional Push & Talk Hotkey control). The SP Dictation Boxes always store your dictation to the clipboard. Even if you accidentally cancel the Box. It's simply impossible to ever lose your dictation again! But if you want to keep the clipboard free for other data you can use the Dictation Box no-clip version. for people with visibility problems. (SP 5.7 Pro has enhanced visibility options). You don't just get one Dictation Box, you get eight additional versions. All equally fast but with their own specialty. 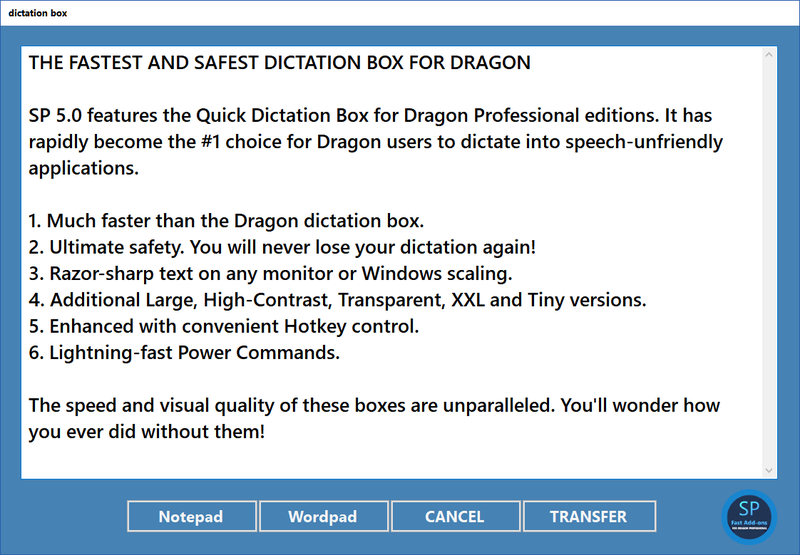 It won't take long before you discover your favorite Dictation Box! (SP 5.7 Pro has more enhanced Dictation Box functionality).